This was a familiar drive to Ryan Field for me. I had done it numerous times as a Northwestern student-athlete. I had done it more recently as a broadcaster. I pulled up to the TV lot and had to show my pass. As one of the parking attendants ripped off the tab on the bottom, he stopped, bent down, and glanced into the car. “Wait, what’s your name?” he asked. As I pulled into the lot and parked, I got out to head to the field. I wanted to walk one lap around Ryan Field by myself before things started to get too busy. I grabbed my bags and headed in that direction. “Hey Lisa!” I heard, while I was walking. I stopped to look around and saw a tailgate of strangers looking in my direction. As much as I tried to make this trip the same “familiar” to what I had done in the past, it wasn’t. And as much as I try to write this blog and make it like my other weekly football blogs, it can’t be. I was honored on Saturday to have played a small part of helping to make this the new norm. It’s hopefully a place we get to soon, where we hear “broadcasters” announcing a game, not just men or women. This was the most important thing I did professionally, and also the most challenging. I hadn’t called a football game at any level. It was a first-time thing, with little-to-no wiggle room to show it was a first-time thing. So I worked to emulate the experience as best I could. I tried to find ways to make myself feel like I had been there before, without having been there before. And so I plowed ahead. I called games from my couch to practice with my friend and former on-air partner Anthony Herron. The former Hawkeye defensive lineman and current Pac-12 lead analyst was invaluable in helping me prep. Once I got past the awkward first five minutes of realization that I was calling a football game off my TV, from my couch, with a friend, the practice with him became extremely important. 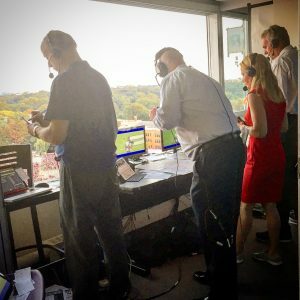 I reached out to various play-by-plays to tap into their thoughts about the dynamics of calling a game from the booth. I had watched thousands of football games, and worked dozens from the sideline. But calling football from the booth is unlike any other sport. You’re a mile-high from the action, so you have to decide when to use your binoculars, when to use your monitor, when to trust your eyes, how to use your spotter (who’s there to help point out everything from tacklers, to blocked punts, to identify running backs presnap.) 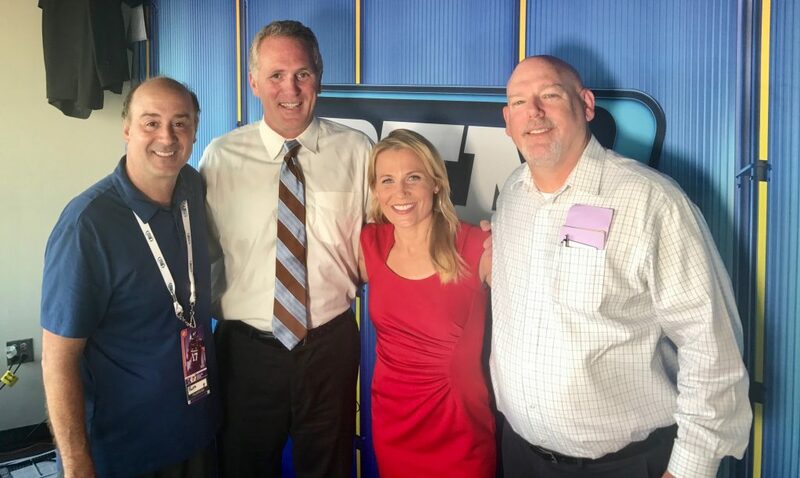 My thanks to this group of people who gave me a list of do’s and do not’s … everything from what style of binoculars to use, to how to set up your monitor, what to include on my broadcast boards, to well-timed pep talks. From the small to big things, thank you: Brian Anderson, Joe Beninati, Tim Brando, Eric Collins, Brandon Gaudin, Tom Hart, Kevin Kugler, Beth Mowins, Matt Park, Kate Scott, Mike Tirico, Pam Ward, Ari Wolfe for your time and advice. This business is subjective, and it takes people believing in you to give chances. All of us have doors opened because someone saw something in you. The folks at Big Ten Network, starting with Mark Silverman, Mark Hulsey and Alex Bertsche gave me that shot. 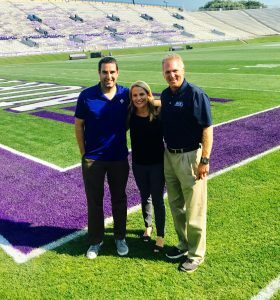 As I took my lap around Ryan Field, about 3 1/2 hours prior to kick, I allowed myself to take in my moment. I took journalism classes about a mile down the road. My journey began here. So yes, to have it come full-circle was special. Since July, all the folks at Northwestern have been fantastically accommodating and supportive. Likewise, the people at Bowling Green were especially helpful and enthusiastic. When it came time to put on my headset Saturday night, I took off my alma mater hat and my fan hat, and I rooted for good storylines, good people, and a good game. I honestly felt like our analyst Chuck Long was more excited about the experience than I was. It was fun to work the game with a College Football Hall of Famer. I’ve grown up as a broadcaster in various capacities with Kian Dowlatshahi and Tom Huet, who were producing and directing. I’ve known them for years, and I felt a comfort level that they would take care of all of us. And they did. 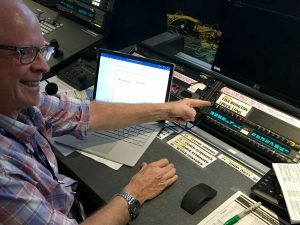 Photo Caption: Director Tom Huet points at the announcer names on his audio panel. My stats and spotter up in the booth, Nick Pinto and Mike Bazemore, both had to carve out this weekend, and in some circumstances turn down other opportunities, to decide to work this game. In many ways, a football play-by-play is only as good as those two positions. When we signed off for the last time, I was satisfied. I continue to be thankful for the women who came before me, those who took chances and were brave enough to trailblaze. Gayle Sierens, Pam Ward, and Beth Mowins have had it way tougher. If there was a little girl watching Saturday, and maybe more importantly a little boy, I hope this becomes their new norm. I understand why this became a headline. But I look forward to the day when I drive back to Ryan Field, walk up to the booth, and no one notices.